F1 Stockcars.com managed to get a few minutes of Frankie Wainman Jnr’s time for a brief chat. 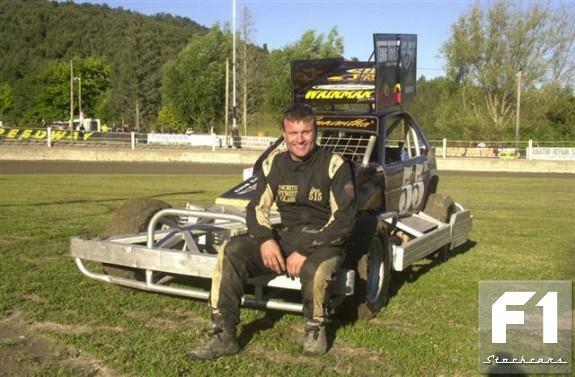 Hi I’m Frankie Wainman jnr driver of the 515 car, I’m 37 years old. I’m from and still living in Silsden Yorkshire and my full time job is a Racing Car Builder. 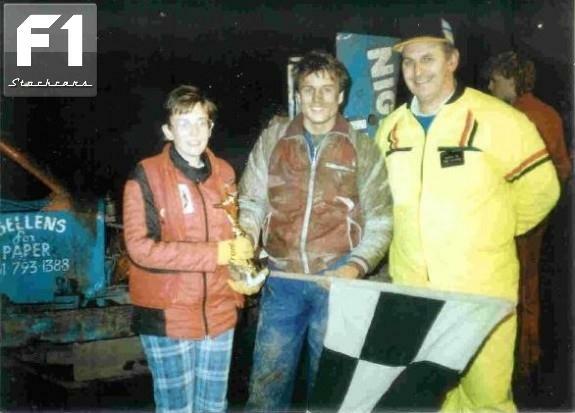 Do you remember your first F1 Stockcar meeting Frankie? No, I was only 10 days old and as a kid it’s funny you never went to watch the racing. I remember playing around with my mates Andy Smith and Andy Hodgson and just mucking about. We used to, and still do every meeting so they all just kind of roll into one. When did you start getting into the racing? It’s hard to say; you know I was born into it, always around it. When I was at school I used to play football, I played Centre Midfield and was quite good at it, played a few games for Yorkshire school boys. Then I had to make a choice, Football or Stockcars and chose Stockcars. So that was your turning point so to speak. Yeah, I started racing Ministox and from about fourteen onwards I was doing pretty much everything on my Dad’s F1 Stockcar in the week to keep him racing and learning my stuff. When you reached the age to move into the F1’s it was in a self built car? Yes that was my car, I’d helped build two F1’s before, both for my dad. That one I put together for myself. Did you watch anyone other than your dad? No, my eyes were on him all the time when he was racing and if I was not racing my ministox then I was either working on my ministox or my dad’s car between races. I remember being frustrated at times back then, I never thought my Dad was aggressive enough. I said to myself when I’m doing it I’m going to give it everything I can. And I still do to this day. Frankie you’ve been in some pretty big races over the years, any that stick out? I think it was winning the last Long Track Championship at Baarlo in Holland. We’d been over a few times picked up a 2nd, but that year we really went for it. We took the Big Block engine out of my Shale car, put it in the Tar car, went over for every Baarlo meeting and the last meeting before the LTC I blew the engine. You know it’s like, we had been putting in so much effort, learning the car set up and then for that to happen. Ron Kroonder the fastest guy round there, said I could use his spare engine if we couldn’t get sorted but somehow we got my engine sorted. The race itself wasn’t a stockcar race so to speak, there was no fencing or anything but I was running with Louw H22 and Ron H217 the whole time. I passed Ron and pulled away from him, he couldn’t keep up. The fastest man round there and I was pulling away from him. That felt great, that was such a buzz, all that hard work paying off. My engine builder was there as well, and for the last six laps he couldn’t watch, he said he turned away and was just looking at the Bar. He could hear me go past every lap and was thinking right Frankie’s done the job getting to the front, now it was down to his job. You know it was a pretty old engine and he just couldn’t watch until he knew he’d done his job. Do you have a preferred surface or track at present? I get asked that a lot but shale or tar I love them both. Northampton is a good track for me, not just because I won a world final there but we do a lot of testing down there and just spend a lot of time there. Which leads very nicely onto which track from the past would you bring back in all it’s glory into the current day. Crewe without doubt. Crewe was a stockcar drivers track, if you had balls you could win at Crewe. The track was just an out and out stockcar drivers track. So away from Stockcars do you have time for any other hobbies? Away from stockcars, sleep, that’s about it. We like to go ten pin bowling as a family, take the kids down have a good night out, a bit of fun. But other than that it’s pretty much racing, repairing not only my own but others, building, it’s something stockcars. New Zealand is like a busman’s holiday for me. I’m holidaying, racing, selling stuff, building contacts and networks, it’s great. Enjoy going to Florida for the winter speedweeks and lately we’ve been going to Tenerife, solely as a holiday, away from all racing and really enjoy it there. New Zealand, the team champs. When Stuart Smith came back this year (2008) he asked me about it. It’s something I’ve wanted to do. It’s not easy to do by any means, it is expensive and to get good cars is expensive. We talked about it and there you had it, the first two of the English team, me and Stu. I’m going to be using my NZ Stockcar. Thinking about it, I can’t say that is most sensible thing to do but it’s just a Stockcar and stockcars can be bent and be bent back, but I think we have a good chance. We know what to expect, I’ve been racing over there for around fourteen years. From day one you are a target, you’re a target because you’re British. Everyone wants to take you out. I remember when I first went there to race. Sonia (Hickey) had sorted me out a car, and was giving me a run down of who’s who in the pits and who I should look out for. In that first race I took out Scott Myers and a couple of others, as I came back into the pits Sonia was standing there with raised eyebrows and said “Do you know what your doing?”. I went over there to race and I was going to race hard, I’d said to myself right I’ll try and take the guys out that are trying to take me out, just try and do it to them first. So we’ve got no surprises to come in the team champs. Like I say I think we’ve got a good chance. We can’t talk about NZ without mentioning Peter Rees, and the impact he made when he came over. Peter was great when he came over, it was the first time he’d ever been out of his country. He came over and spent just every minute with me in the workshop. We sorted him a good car, a car that could win the world final. And Peter learnt that car, he listened to everything you would say to him. He went out there and got laps under his belt, that’s the only way your going to have a chance to win the W/F. Don’t go out there getting all silly, learn how to race that car for that race. And Peter came here to win it. The last Belle Vue meeting before the W/F Peter showed that he had not only learnt but was going for it. He got the fastest time in the overseas time trials, was 3rd on the grid and was up for it. Peter won a lot of UK fans during his stay, any chance of Peter making a return? It’s very, very expensive for the NZ lads to come over, it really is. They’ve got to take a lot of time off work and the exchange rate is not very good for them coming here. And for Peter it’s probably at his busiest time for work. So it was very hard for Peter, but never rule it out. Thank you very much for you time Frankie it’s been great talking to you. We wish you and all the team the best of luck in the NZ Team Champs, and with luck F1 Stockcar will catch up with you later in the year. First of all Frankie congratulations on becoming the first man to win the 240’s three times. Do you recall much of the race? Thank you, It is an amazing achievement and something I’m very proud of. The first race went pretty much to plan. The next race me and Stuart kind of went different ways, not helping each other, each thinking the other was a lap down. But we all re-grouped in the pits and Race 3 started out a pretty straight forward affair. Tom Harris was doing his thing, along with some good blocking from Mark Taylor. Then came the race stoppage, You were sat in the car for quite a while looking around, seeing who’s where and trying to work out where your friends are. That is a major difference with NZ Stockcars, it’s not just you against the rest like UK racing, you have friends out on track that will block for you, or move cars out of your way, and likewise your main rivals have their friends looking to do exactly the same to you. When the race got going again, I knew I had a palmy (friend) car around me, and Tom & Mark behind but it just went ballistic. I just had to hold on, keep my foot down, keep away from the wall. Tom saw potential trouble and came into assist, but ended up giving me a big hit! My only instinct was to get moving again, You can’t be stationary, that’s just not an option. I got over the line, had to fend off another attack. The racing doesn’t stop until the red flag comes out. The 3rd race is the one that really matters, everyone is pumped for that one. It must be quite strange not knowing if you’ve won, even if you take the flag. That’s NZ racing, it is very strange compared to how we’re used to racing but that’s part of NZ racing. It’s horrible sitting in your car trying to work out not only your own points, but your rival’s. It’s not as easy as you may think, you don’t get lap boards or your position indicated during the race. Trying to keep up with who’s a lap down and where they finished and work out points while clearing your own ‘racing head’ and getting your breath. I hate sitting there waiting, it feels like you’re there for hours. I knew I was close, And to get told I’d done it by just 1 point was unbelievable. But then you starting thinking hold on, there might be an amendment coming, a driver might be lodging a complaint or appeal to the race stewards. That must make for a unusual parade lap. They (NZ) have only really just started doing parade laps the last few years, But the amount of people that hung back this year was fantastic. Which brings us onto the team champs. The Teams was something I never thought I’d see in my racing career. The UK team was big news, the Team Champs are huge in NZ, people were talking about the UK Team and most thought we would just end up cannon fodder as we don’t race that way and don’t have any experience in the Team Champs. Tony Mac was in our camp and talked the team through how we had to drive. Our 1st race saw us up against the defending champs Palmerston North Panthers, We got fantastic support from the crowd. The Panthers team are considered one the best teams. We really shook the NZ’ers up. I don’t think anyone was expecting that! We didn’t win the round, but we showed the other teams and the crowd that not only we could drive as a team but we were there to win it. The next race out was against the Mustangs and we were superb, we raced as a team and raced them off the park. I got the win for the team as a result. The Saturday we were racing for 3rd place (highest finish team UK could achieve), Tom really made an impact with the NZ drivers and crowd. I have quite a fan base there so they know my driving style, Stuart made quite an impression the year before, but no one had really heard of Tom let alone seeing him race. He raised quite a few eyebrows with his mature driving skills and his timely use of the bumper, both hitting and blocking. We never won the team champs but we certainly made people sit up and take notice. We got a 1,2,3 finish in the first race of the night against Hawkes Bay. Everyone in the team drove superb, everyone did their job. I got taken out early on in our final race against Stratford but Stuart took the win (his 2nd) for the team, and again Tom did an expert job for the team. To run a team is expensive, and I’d like to thank everyone that helped sponsor the team. People were saying where does the money go? And didn’t want to pay for someone else’s holiday and the like. I had my own car, the others were NZ cars. We paid for the damage, and parts out of that money. The UK Drivers were superb and I’m very proud of how we conducted ourselves. We worked on the cars and tried to give them back in as best condition as possible. No one went out and trashed one unnecessarily. Team racing is hard racing; cars do get damage, but every loaned car was used with respect. So hopefully we have good case for getting cars for our next UK Team. Another UK Team! 2010? And what are your thoughts on a UK Team series here in UK? Like I said it is very expensive, But this year we’ve shown it can be done, and that we are not just out there to make up the numbers. And if people are doubting where the raised money went, it went on the cars and I can’t thank enough the people that put money in and made the event happen. As for UK teams, no it’s not something I think would take off as big as it does in NZ. It’s part of NZ culture, it’s like the FA Cup Final is in England. We have tried team racing in F1’s before but it just didn’t work. Our cars are just not built for team racing. And to start a team championship from scratch would involve huge investment. No, if you want to see or be involved in Stockcar Team Racing then it’s got to be in NZ, anything else just wouldn’t stand up against it. We went out viewed as underdogs this year, hopefully we will be able to return next year only this time we will go out there viewed as a threat, a serious challenge. I’m even more confident now that we can win it, and we will win it. Thanks again for your time Frankie, we all at F1 Stockcars.com wish you all the best in the 2009 season, and it goes without saying Keep turnin’ left. And thank you, with any luck you’ll be catching up with me again towards the end of season. Cheers.